Julia Child would have turned 100 years old today, and while it may seem appropriate to celebrate her birthday with a decadent dessert, it would be even more fitting to whip up something fresh and delicious from the garden! 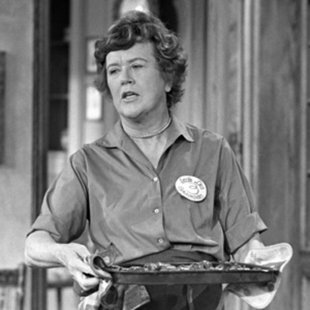 The name Julia Child is often synonymous with butter, cream and animal fat -- not to mention delicacies like crepes suzette and ile flottante (a "floating island" concoction of meringue and custard), but when her seminal cookbook,Mastering the Art of French Cooking, came out in 1961, TV dinners and convenience foods had become a big part of American culture. With her book and ensuing cooking show, Child encouraged people to get back into the kitchen, placing an emphasis on using fresh, local and seasonal ingredients. "Cooking is not a chore it is a joy. Dining is not a fuel stop, it is recreation," she once said. "Julia Child's principles are key," says Angela Ginn, registered dietician and spokeswoman for the Academy of Nutrition and Dietetics. "Fresh ingredients, vibrant colors, diversifying your plate and healthy preparation," she says, were the tenets of Julia's cooking and eating philosophy -- and the world is finally catching on today! Child believed in enjoying all the great tastes in life, but also in not overdoing it. "Moderation. Small helpings. Sample a little bit of everything," she once said. "These are the secrets of happiness and good health. You need to enjoy the good things in life, but you need not overindulge." Another important lesson from Child: "The key to healthful dieting is to eat small helpings and a great variety of everything. And above all have a good time!" David: Have you ever cooked something Julia that just turned out awful? Julia: Yes, lots of times. David: What do you do then? What happens? Julia: I give it to my husband!